This is a sparkling iridescent medium with a pearlized effect. 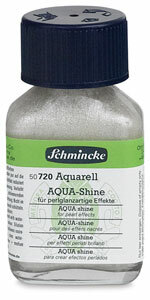 It can be applied pure to dry paint, or mixed with watercolor to create beautiful tints. It remains water soluble, although dilution reduces the pearlescent quality. This medium has retarding qualities, slightly lengthening the drying time of colors. Highly effective in abstract or semi-abstract passages of a painting, it shows best over dark colors.